The literal meaning of the word: "Shinjuku" is a "new station". In 1634, Naito-Shinjuku makes a station (juku), which was new (shin) on the main highways of Tokyo. Naito is the name of a large landowner (daimyo), which controls all the land in Shinjuku and Kabukicho area since the 1920s. The castle is located in the area. The land is now a public park, Shinjuku Gyoen. In 1991, the Tokyo metropolitan government has moved its office from Chiyoda to Shinjuku area. Shinjuku neighborhood consists of several districts, namely: tower skyscraper district in western area, consisting of a row of concrete jungle of skyscrapers towers including the Tokyo Metropolitan Government Building and upscale hotels like Keio Plaza, Hilton, Hyatt Regency and Park Hyatt. Some skyscraper tower is equipped with shops and restaurants in the area beneath the floor, and additional restaurants at the top level. District "Kabukicho", much like a theater name "kabuki", as the area of ​​"red light" the largest and most wild in Japan with many restaurants and cafés, bars, a nightclub, an arcade game "pachinko", hotel in hourly rate and various shops selling trinkets of commodities. In Shinjuku, particularly in the district "Omoide Yokocho", we can try a variety of exciting culinary specialties like Japanese Ramen, Soba, Sushi, Yakitori and Kushiyaki, complete with his trademark drink is sake. If we want to try Korean food, in the area of ​​"Shin-Okubo Koreatown" sells various kinds of Korean foods like kimchi, and others. As a metropolitan city, world-class restaurants at the top of several skyscrapers tower Tokyo. Restaurant-roof-top restaurant, besides offering a charming view of Tokyo city from a height, also offers world-class cuisine; of course the price is also relatively expensive. 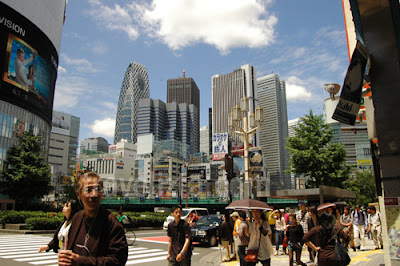 Search for discounted hotel in Shinjuku district!